What Is a Sorbet Frozen Dessert? 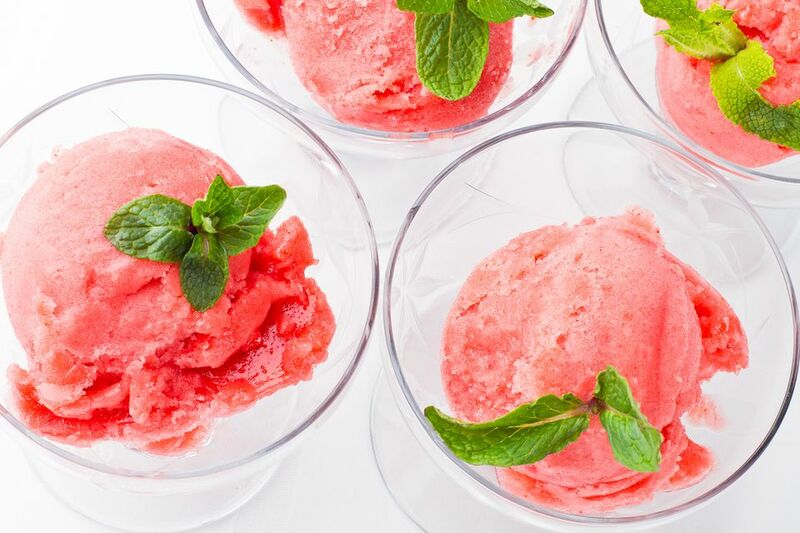 Sorbet (pronounced "sor -BAY") is a frozen dessert which is typically made with some kind of fruit juice and/or puréed fruit, plus a sweetener (usually sugar), along with other flavoring ingredients. Wine and liqueur are sometimes used for flavoring sorbet. Sorbets can even be flavored with chocolate or coffee. Note that the one ingredient you won't find in a sorbet is any dairy product, such as milk or cream. Nor are eggs (yolks or whites) used in making sorbet. Unlike ice cream, sorbet doesn't have air whipped into it, which gives it a very dense consistency and intensifies the flavor. In addition to being served as a dessert, sorbet is sometimes presented as a palate cleanser between courses of a multicourse meal. The word sorbetto is merely the Italian word for sorbet. Does Gelato Have More Flavor Than Ice Cream Does? Make Real Gelato at Home. It Is Easier Than You Think.